The Duluth Icebreakers 12A's upended Andover in five overtimes in the 12A State Tournament quarterfinals. During pregame warmups, the buzz along the glass before the Moorhead and Wayzata quarterfinal matchup of the Bantam AA State Tournament was that the Trojans, with all of their talent and experience, might not survive a fast start by the Spuds. Within the first five minutes of the opening period, all of those fears began to manifest, as Aaron Reierson and Abe Carlson put Moorhead up 2-0. The packed Cullen Hockey Center tentatively went bananas after Reierson’s goal, but after Carlson put the home team up 2-0, the arena’s new lobby and freshly wiped glass were in danger of crumbling under the weight of a town’s jubilance. Wayzata would go on to win the game 5-3 after racking up five scores in the second period, but there are still sets of ears ringing thanks to the delightfully boisterous Moorhead crowd. Two Moorhead mentions in two sections is purely coincidence, but the list wouldn’t be complete without a mention of the Spuds’ 12A team. The Spuds advanced to the state tournament after scoring one-goal victories against Olympic Region rivals Crookston and Roseau, and made the most of their trip to Grand Rapids, upending top-ranked Stillwater Black by yet another close score of 5-4. Joining Moorhead from the Olympic Region were the Duluth Icebreakers, backdoor darlings who lost an overtime thriller against Roseau in the Region semifinals before downing Alexandria 9-2 and avenging the loss to Roseau with a 4-1 win over the Rams to earn a trip to State. The Icebreakers knocked off Andover in the state tournament quarterfinals and topped Moorhead for third-place in a successful venture to Grand Rapids. Abe Carlson slams into the boards after scoring in Moorhead's 5-3 loss to Wayzata in the Bantam AA State quarterfinals. The Osseo-Maple Grove Hockey Association thrives at multiple levels, thanks in large part to a regimented and effective strategy, heavy on structured puck movement and the ability to roll three to four lines without a noticeable talent drop-off. The Bantam A Leafbirds run their system to near perfection, typically wearing down the opponent by forcing defenders to chase the puck all over the offensive and neutral zones. The Warroad Bantam A team, armed with 11 skaters covered in bumps and bruises, provided an antidote to the machine. The Warriors had two designated centers, three defenders, and simply filtered in other forwards as needed depending on game situation and fatigue level. The team used all 200 feet of the ice, lofted numerous Hail Mary-type passes just under the Cullen Hockey Center’s ceiling, shot at will, and played as if there were no boards or red line. Creativity trumped convention for Warroad, and the philosophy carried the Warriors to a 2-1 win in overtime over the Leafbirds. Only one team in the entire state across all levels finished with a perfect season, as the Moose Lake Area 12B team romped their way to a 40-0 record for the year and a steamroll-esque performance in the state tourney. The Rebels put their shoot-first-be-patient-later offense to good use during the state’s final weekend, defeating Red Wing, Willmar, and Mankato by a combined score of 21-4. 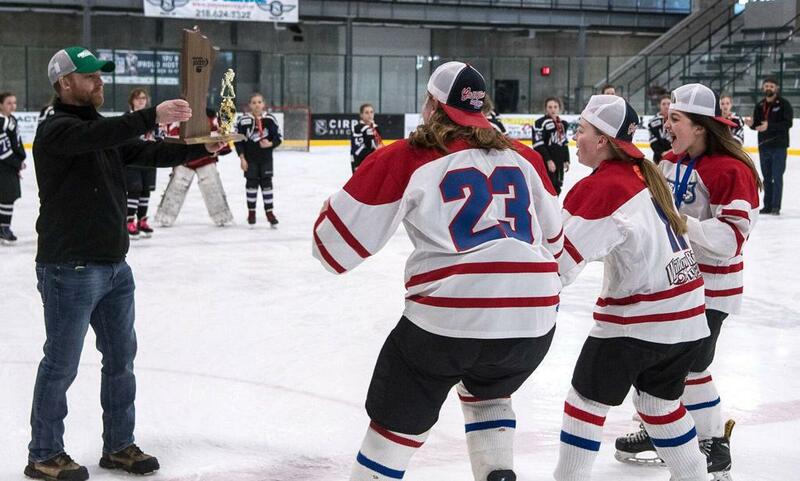 Moose Lake 12B's capped a 40-0 season with a state title in March. The state tourney weekend brought fans at each site skill, excitement, and some dramatic finishes. There was none more dramatic than how the Duluth Icebreakers 12A won their first-round game against Andover in Grand Rapids. Awarded a penalty shot in the third overtime and failing was a bad sign for Izy Fairchild for Duluth. Making matters worse for Fairchild, she later took a penalty, handing the Huskies a premium chance at victory. However, in the fifth extra session, Fairchild scored one of the prettiest goals we saw in 2018, walking past a top defenseman in the state and then beating Andover star goalie Layla Hemp short-side, top-shelf for the win. Before being thumped 6-1 in the Peewee AA South Region final by Woodbury, Eden Prairie eked out one-goal wins over Andover and Wayzata. That penchant for late heroics and close scores should have been a sign of things to come. The Eagles upset the state's top team, Chaska-Chanhassen 5-4 in overtime of the quarterfinals, a talented Edina squad 4-2 in the semifinals, and held on for a rollicking 2-1 win over No. 2 ranked Woodbury in the state title game. Goaltender Isaiah Paulnock was named the tournament's Most Valuable Player, posting more than 25 saves in each game for the Eagles. Isaiah Paulnock of Eden Prairie makes a save during the Eagles' 4-2 semifinal win over Edina at the Peewee AA State Tournament. In the third week of February, Edina High School captured its third consecutive state championship in girls' high school hockey and has a legitimate chance to make a run at a fourth next spring. The Edina 15A and 12A youth teams earned state championships a few weeks later at their respective levels, both wins coming in overtime, giving the Hornets state-champion groups from ages 18 to 12. The future doesn't have to look rosy in Edina. It just has to look brown - as in state championship trophies. The 15A team outscored opponents 10-3 en route to the state title, and finished the season with a record of 36-2-5, while the 12A' went 40-6-3 and for the season. None of the 12A Hornets' losses were by more than two goals. The state tourney features new uniforms for some teams, new down vests to be shown off at the State Tournament banquet for others, dyed hair, suspenders, streamers, balloons, fireworks, and maybe even a live zoo animal. For the record, Chaska-Chanhassen's Bantam AA team had the top kits, pulling off gold jerseys and socks, and using a punchy purple script that spelled out "Chaska Chan." A winning formula now and forever is a sweater that acts as a backdrop for the lettering, and lettering in a clear and easy-to-read color. Chaska-Chanhassen's Bantam AA jerseys were bold without being obnoxious and scored extra points for the cursive script.